The catalogue of a group exhibition held in Municipal Museum of Modern Art (2016). The exhibition, Montañas y ríos sin fin, presents the work of six contemporary artists from Canada and Ecuador: Gu Xiong, Patrick Mahon, Gautam Garoo, Jenny Jaramillo, Esteban Ayala and Ulises Unda. The works on display address the historical, social and environmental effects of mining in the districts of Portovelo and Zaruma, located in the province of El Oro, Ecuador. Mountains and Endless Rivers began in late 2014, as a joint project between Patrick Mahon, a Canadian artist and professor in the Department of Visual Arts at the University of Western Ontario, and Ulises Unda, an Ecuadorian artist and doctoral candidate in the Same department. 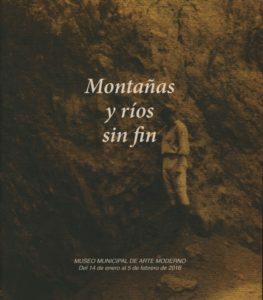 An initial residence in the province of El Oro, Ecuador, brought together artists and academics from Canada and Ecuador; The result of this collaboration was an exhibition in Cuenca, in the Municipal Museum of Modern Art, in January 2016. The catalogue for this exhibition features Gu Xiong’s installation, A Water of Gold, on pages 8-9.